The Mills Dry Dock Company of Buffalo, New York launched the wooden steamer FLORIDA in 1889. At 270 feet long, the ship was considered one of the biggest wooden steamers on the Lakes. The last trip of the steamer FLORIDA started in Chicago in mid-May of 1897. After loading a cargo of flour, syrup, manufactured goods, and barrels of whiskey, the ship proceeded up Lake Michigan, though the Straits, and into upper Lake Huron. At about 9:00 AM on May 20, the FLORIDA was struck by the steel steamer GEORGE W. ROBY, in heavy fog off Presque Isle. Captain Henry Murphy of the FLORIDA said the ship collapsed like a jackknife when the stern hit bottom in over 200 feet of water. The air escaping from the wreck blew the cabins off the ship as it sank, leaving a lot of wreckage on the surface, including the ships galley range and safe, floating with parts of the cabin. All crew members from the FLORIDA were taken aboard the ROBY. There were no casualties. The shipwreck rests in a little over two hundred feet of Lake Huron water. The wreck is intact, except for the forward cabins which blew off during the plunge to the bottom, from the bow to just aft of the boiler room. The main deck is about 170 feet deep. Two cargo decks below this deck can be explored. Barrels and sacks of flour, pots and pans, and the legendary whiskey barrels (this whiskey is now a little waterlogged) can be found in this area of the wreck. A partially intact middle cabin on the main deck still has a small stove used to warm the crew on chilly nights. The upper boiler room is constructed with iron instead of wood. Behind the boiler room the ship is sheared exposing both lower decks. 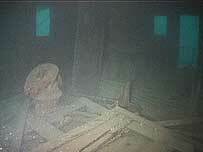 The engine and rudder post lie in a mass of collapsed wreckage about twenty feet deeper than the main deck. Gauges and controls are still attached to the starboard side of the engine. The rudder and propeller can be found under what is left of the stern in a little over 200 feet. The FLORIDA was built in an era when steam powered ships still carried sails. The main deck forward of the machinery cabins is littered with these masts. 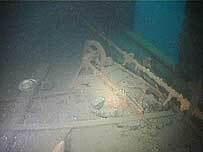 At the bow, two folding anchors are still stowed next to a large iron beam used to drag them on and off the deck. At the time of these images, 2003, the mooring line was tied to this beam at the bow. A round trip on this wreck, bow to rudder and back, requires over 500 feet of swimming in 180 plus feet of water. Plan your dive accordingly!